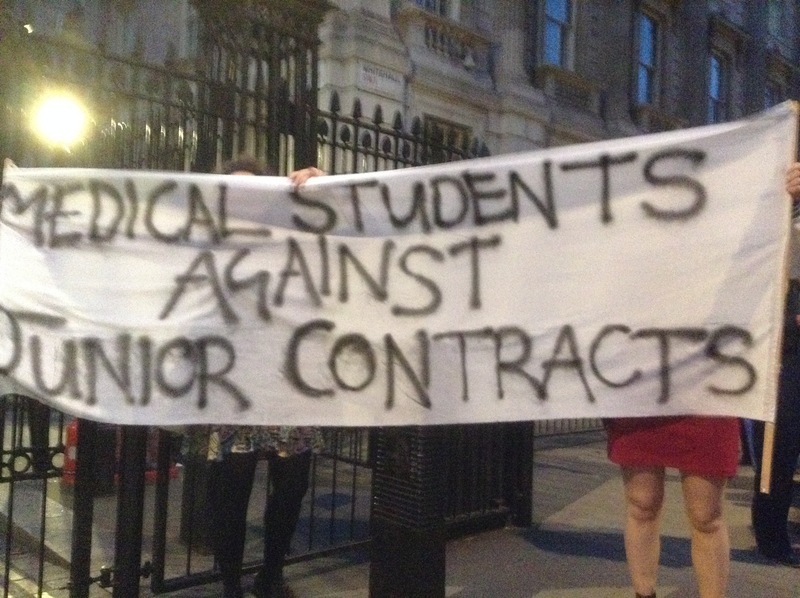 Many final-year medical students across the UK logged into their emails today to discover a message advising them against disputing a controversial new contract. The controversy stems from an increase in sociable hours, reduction in GP pay and the lack of pay protection for maternity leave. This comes after hundred of medical students joined senior colleagues at demonstrations in Manchester and London against the new junior doctor contracts. 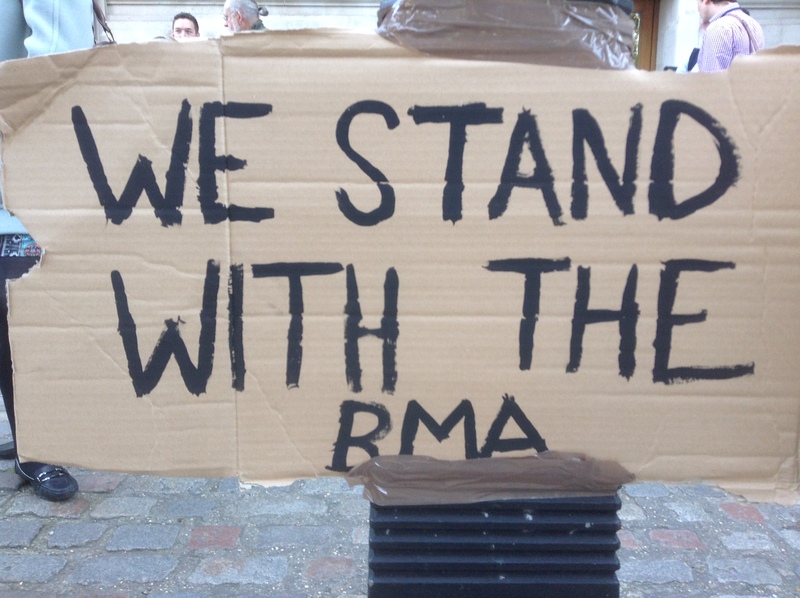 The contracts have been described by the BMA as: “unsafe and unfair,” a statement which has been supported by the presidents of 11 Royal Colleges, the bodies responsible for regulating medical professions. With prominent radio presenter, and Glasgow GP, Dr Margaret McCartney interested in the case and promising to investigate the emails further, this case is likely to resurface in the near future. Impassioned doctors marched in their thousands to Downing Street this evening, angry at the government’s approach to their contract re-negotiation. In the shadow of Westminster Abbey at Central Methodist Hall, doctors of all ages and experience gathered to express their displeasure. They are unified and state in one voice that their new contracts are a threat to the NHS and patient safety. Changes to the contract include: an increase in hours classed as sociable work, removal of safeguards for maternity pay, and a reduction in GP salary. Joanna Sutton-Klein, who helped organised the event, said she was ‘extremely pleased’ with the turnout. As seen in this video, the junior doctors are united against the upcoming changes. The crowd listened as Johann Malawana, chair of the BMA Junior Doctor Commitee (JDC) spoke, cheering in support of yesterday’s decision to ballot junior doctors on whether to take industrial action. Junior doctors, and other health professionals, eagerly await the outcome of Mr Hunt and Dr Malawana’s meetings, and seemingly stand ready to fight hard if significant compromises are not made by the Department of Health. Ballots are in the process of being prepared and will be sent out to all junior doctors in England in due course. Yesterday, the BMA’s junior doctor committee voted unanimously to ballot their members for industrial action, which if agreed upon, would be the first time junior doctors had walked out of work since 1976. With thousands of doctors set to protest meetings with NHS Employers (NHSE), Jeremy Hunt is now once again offering to meet with the BMA. Previously he has said that the doctors’ union is a ‘roadblock to reform that will save lives’, threatening to impose the contract with or without the support of doctors. In the face of vociferous opposition from across the medical profession, NHS Employers have cancelled all engagement meetings arranged to bypass union officials and talk directly to junior doctors. NHSE Chief Executive Danny Mortimer apologised for the short notice in an email sent to junior doctors across the country, stating ‘Our preferred position has always been to negotiate with the BMA’. A London protest planned before the announcement is still going ahead with junior doctors online calling the cancellation ‘cowardly’ and ‘outrageous’. I see you read my last letter, and saw it as motivation to repeat the experience on My return flight today. Last time you dazzled me with tardy loading, rude employees and a spectacular unawareness as to whose fault all the problems were. I truly appreciate the effort you went to ensure I had a similar, but not-quite-identical, flight. Delaying the flight for 45 minutes with no explanation was a fantastic start. Stretching this delay for an hour and a half was a touch only a master could bring. But you still weren’t done. Opening the cabin door and waiting 20 minutes to get the stairs ready was a decision that I was thrilled just to witness. I particularly liked the added nuance of leaving the cabin door open so the passengers got cold and irritated. I’m sure the one year old really appreciated that. A passenger who actually made quite a lot for my flight and is a bit ticked off you couldn’t be on time either way. On behalf of all your passengers on the 230 flight to Alicante on 14/09/15, can I pass on our thanks for letting us wait in the queue at the departure gate for 20 minutes after it had supposedly closed? After all, I’d yet to experience the blind panic of running through an airport thinking I’d miss a flight. The joy at turning up to a gate that had yet even to begin letting passengers on the plane was matched only by the time I first saw a baby born. Thank you for allowing me to tick this off my bucket list. Even more appreciated was the instruction to ensure we had boarding passes at the ready, to ‘ensure a quick departure’. After all, it must have been our poor queuing technique that delayed the flight and we deserved to be patronised for that. Finally, I’d like to give you my sincere gratitude for the multiple in-flight announcements asking people to ‘take their seats as promptly as possible.’ The onus is clearly on the passenger to foresee a complete lack of luggage space, and we should have simply carried all our possessions on our persons rather than bring bags at all. I for one was truly humbled to be allowed the privelige of putting my bag 30 rows behind me. Yesterday, I posted a piece looking at Heidi Alexander, the new Shadow Health Secretary, and I spectacularly jumped the gun. I suggested that she had little record on health matters and I couldn’t make much of an assessment of her qualities to be Shadow Health Secretary. I’m very pleased to say I was wrong, and I can. Heidi Alexander has a rather robust record of fighting for her local NHS provision. More impressively, she has a few big wins under her belt. She was instrumental in the nationally covered campaign to save Lewisham Hospital, and has continued to raise concerns about the NHS in herconstituency. How translatable is successfully campaigning at the grassroots level to the frontbench, where Alexander must publicise and defend Labour’s policies on the NHS? I’m not sure. Will she be able to cope with the arguable more-fun element of attacking the Tories over their health record? Probably, if the articulate and personal speech below is anything to go by. In short, I was wrong about Heidi Alexander. She may not have much experience speaking from the frontbenches, and she may not have served on any health posts so far in her political career. However, what she does have is the gumption to fight for her local community and her local people. Bring that to a national level, and I’m sure she will have plenty of allies amongst the health sector. Thank God It’s All Over. Now Who Exactly Who Is Heidi Alexander? Not sure if anyone else has noticed but apparently there’s been a Labour leadership election. Hard to believe isn’t it? I’ve hardly seen any tedious wall-to-wall coverage of a contest which reached an inevitable conclusion weeks ago. I’ve definitely not seen Labour supporters reveal the worst of themselves and their party across all parts of the Twitterverse. And I’ve definitely not heard of the new Shadow Health Secretary, Heidi Alexander MP – so I thought I’d have a quick snoop and see what she’s about. Swindon-born Alexander is the daughter of an electrician and attended her local comprehensive. She did well enough to attend Durham University and earn a BA in Geography and a Masters in European Urban and Regional Change. Prior to her election to the safe seat of Lewisham East, she served as a parliamentary researcher, local councillor and a deputy mayor. In her sole term in Parliament, she’s served as an Opposition Whip and a shadow Minister for London. Before her ascension to the frontbench proper, she worked as the Private Parliamentary Secretary to flash-in-the-pan leadership candidate Mary Creagh. Heidi Alexander in her five years in parliament has never rebelled against the party whip. In short, she’s quite different from her new boss. Yes, they’re both career politicians – but only one has spent his career rebelling against the party he now leads. Funny old world. Miss Alexander is short of practical experience within the health sector but as Chair of the All-Party Parliamentary Group on Choice at the End of Life, she clearly has personal interest in the area. Unfortunately, her service as a whip prevented her from articulating her own positions on areas such as junior doctor contracts, 7-day NHS provision or anything about health at all really. I’d love to say that Heidi Alexander will be a resounding success as Health Secretary, offering a credible alternative to Jeremy Hunt*. However, I can’t in all good faith say that, or even anything at all about what Alexander might be like. Regardless, she will be a welcome breath of fresh air. Andy Burnham in his nearly six years holding the health portfolio, both in opposition and in government, did very little to convince many people that he, or his party, would bring about the changes the NHS needs to survive and thrive. Even if Heidi Alexander’s main achievement as Shadow Health Secretary is to not be associated with Mid Staffs then she’ll do more for Labour’s long-term electoral chances than Andy Burnham has these last few years. *This is where I’d like to point out the pile of crumpled socks next to me is probably a more credible health secretary than Jeremy Hunt.